The newest issue of eContact! 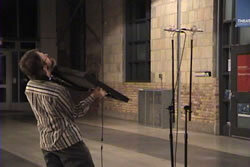 shines the spotlight on presentations from the 2011 Toronto Electroacoustic Symposium (TES). With Keynote Speaker Jonty Harrison and sessions grouped around such themes as creation, algorithms, listening, analysis, space and curation, the 5th edition of TES was co-presented by the CEC and New Adventures in Sound Art (NAISA). Several interviews complete the issue. Schedules, abstracts and programme notes from the symposium are available on the TES 2011 pages. A TES 2011 Photo Album has been posted to the CEC’s Facebook page. 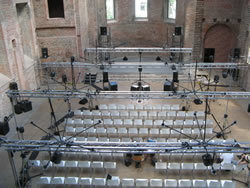 A discussion of the role and handling of space and spatial control in the composition and performance of stereo and multi-channel acousmatic music, from the founder of BEAST (Birmingham ElectroAcoustic Sound Theatre) at the University of Birmingham, UK. Darren Copeland performing with the Holosonic Audio Spotlight mounted on a tripod stand. Photo © Stefan Rose. In MotherVoiceTalk (2008), Hildegard Westerkamp uses archival and field recordings of conversations, reflections and nature. The work negotiates boundaries that are often blurred in the electroacoustic medium: public and private, self and other, time and space. In the 1990s, Gwiazda explored “virtual audio” to create surreal collages of sounds composed with extremely precise sound localization. Positioned exactly in the “sweet spot”, the listener experiences the work in a three-dimensional field, despite the use of only a pair of speakers. 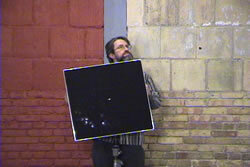 Due to its extreme directionality and its portability, Holosonic’s Audio Spotlight offers unique possibilities for spatialization in live performance. Sounds can be “positioned” virtually anywhere in the performance space by aiming the Spotlight at its reflective surfaces. 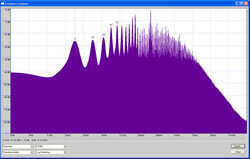 The techniques, methods and materials required to realize an electroacoustic-computational feedback system instrument for the purposes of synthesizing complex sounds are presented here, along with considerations of fractal mathematics, control theory and iterative phenomena from the natural world. The Sonik Spring is a multi-purpose digital controller for real-time generation and processing of sound. The interface consists of a 15‑inch spring that exhibits unique flexibility traits; changes in its length and shape are mapped into control and synthesis parameters. Started 12 years ago by the authors, the Soundson program is a web-based project / environment where composers or students living in different countries can create a collective sound composition through an ongoing exchange of sounds. Generative music in the realm of EA uses a computer to autonomously generate music. The director of the Generative Electronica Research Project (GERP) describes research to create software that uses probabilistic methods and genetic algorithms to create electronic dance music in specific styles. The similarities between the creative tools and approaches used by artists of the acousmatic and intelligent dance music (IDM) milieux today are the points of convergence upon which mutual appreciation of the works created in these communities can be built. Ageism may appear in the practice and study of EA, as can be seen from three separate viewpoints: chronological, technological and stylistic. This phenomenon affects all ages, not just older members of the EA community. In the heady days of the early 1960s, Avni studied under Vladimir Ussachevsky at the Columbia-Princeton Electronic Music Center, which had great impact on his composition. After returning home to Jerusalem following his studies, he founded the second EA studio in the country. 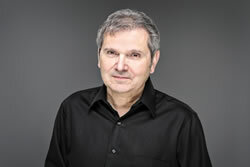 Following studies in Vienna and Utrecht under Gottfried Michael Koenig, Mashayekhi would become a key figure in the Iranian contemporary music scene. His works question ideas of national identity, with a critical regard on the impact of the European new music scene in Iran. 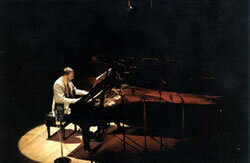 It is hard to underestimate Mead’s contribution to the piano and tape repertoire, as he has commissioned around 60 such works, culminating in Harvey’s Tombeau de Messiaen (1994). Perspectives on the performance of works for instrument and tape are discussed here. For Mimaroğlu — former student of Vladimir Ussachevsky at the Columbia-Princeton Electronic Music Center — recording technologies bridge activities ranging from politically oriented electronic music composition to producer at Atlantic Records on key releases by Charles Mingus and Ornette Coleman.